I’ve been working on some writing projects off and on for the last month or two but everything is disjointed and muddled. I don’t have much of anything pressing to say about life, which bothers me. Even with prompts, I’m coming up almost empty. The best I’ve got are little snippets of words and pictures from our days that I post on Facebook. What started out as an outlet to practice being succinct (and honestly, get some instant gratification with all your liberal “like”s) has turned itself into a whole lot of nothing else. It feels like I’m living in the shallow end of the pool. I’m not sure what to do about that. Haven’t I said this all before? Oh yes, that’s right; I say it about every other post on this blog, going back for a couple years. Oy. Until I write again . . .
After several recent posts I’m realizing my theme, at least for now, is 2015. I guess I’ve gotta catch up. I had so much fun taking photos in 2015, so here are my most favorite. I will say that for me, in my novice photography skills, the best photos are mostly ones of luck. Very few include the right lighting, depth of field, or focus. But I hope that I’ve caught the moment or the person, and the skills will hopefully sharpen as I practice. Jason has been the encourager of my interest in photography, but he’s also been the technical man; educating me (and reminding me again and again) what aperture, shutter speed, etc., mean. He has helped me take the image I can see with my eye and use the tools in my hands to try and make that picture happen. Jason even took a few of these photos, which makes me excited because it means I’m actually in some of them! Enjoy–though I guarantee you won’t have as much fun looking at them as I did being in the moment and capturing them. These photos were taken with a Nikon D60, mostly with a 50mm lens. June has been the month of parties. And of course we have good reason to celebrate with two Haggard birthdays five days apart in the first part of June. The party for Imogen was sort of inevitable, but even I was surprised I was thinking about having a party for my birthday, being the introvert I am and how the last year has gone. The thought of organizing anything seemed a bit daunting back in April when I was thinking about it. But it’s the big 3-0; I felt like I had to do something memorable. I thought about it for a while and then settled on it. I will admit, Pinterest had something to do with it. Yes, it can take over your life, but dang it has good ideas. It just makes you want to have a party (or two, in my case). I will say that Blythe is really good at throwing parties. She talked with me about the party beforehand and we landed on a small evening event, just ladies, with mango mojitos and Mexican appetizers. Once that was settled I went to, you guessed it, Pinterest for some ideas to throw Jason’s way, since without his consent I had volunteered him to do some of the cooking (he did happily accept the challenge when notified). 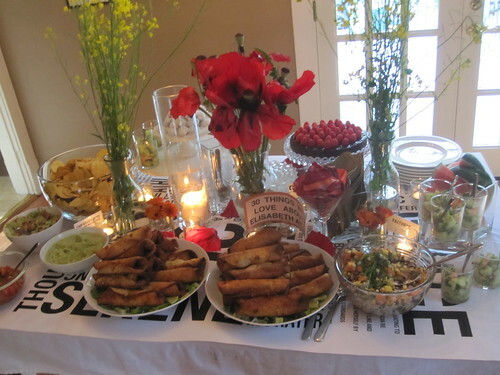 The menu included chicken flautas with avocado cream sauce, shrimp ceviche, a smorgasboard of chips and various dips, and dessert (I’ll get to that later). 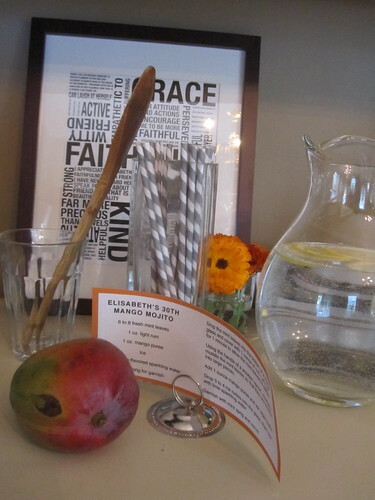 And of course, the mango mojitos. As the date of the party approached, I was really looking forward to seeing how Blythe was going to set-up and decorate. 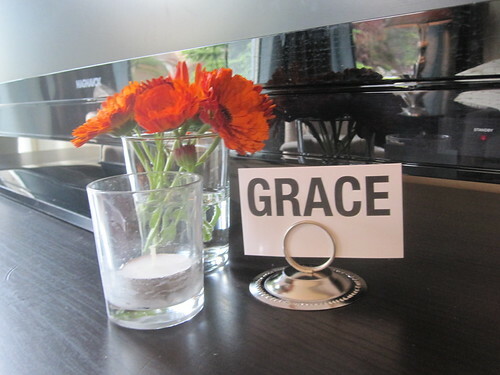 Her hospitality seems fancy and luxurious to me, without feeling stuffy at all. Blythe had collected feedback from ladies at our church on what they appreciated about me and had a graphic designer put together a beautiful collage. She had it printed on large pieces of paper which served as the tablecloths and gave me a smaller framed version of it to have as a keepsake. I was a bit overwhelmed when Blythe explained the whole theme to me. Kind of like I was overwhelmed when she volunteered to throw me a party in the first place. I am in shock that God has given me such thoughtful, talented, caring, sacrificial friends. People that love me – many people of whom I didn’t even know just a few short years ago. The rest of the night entailed chatting, eating, drinking, opening presents, a few rounds of catchphrase, some prayer and more chatting. It was a great night. Sometimes I get stressed during parties, wanting to make sure that everyone is mingling and feeling included. I really didn’t worry at all during this party, it all flowed so smoothly. And of course there was the birthday dessert – chocolate flourless cake a la Jason, with whip cream and raspberries (pictured on the back of the table below). Because nothing Jason makes can be simple or unsophisticated, this dessert was made with Belgian chocolate and French butter (yes, I also didn’t know French butter existed, but I suppose if anybody should have a butter named after them it should be the French). I will say there was one really sad moment to the night (besides my pre-party meltdown, but that is typical for me and was alleviated by an SOS phone call to my good friend, Jessica (who reminded me of reality) and of course some food). Anyway, my other sad moment was when I got out my camera to take pictures of all the beautiful-ness at the party and the battery was dead! I am still greatly annoyed about that. Thankfully, Blythe also served as an impromptu photographer so you can get a good sense of the whole affair. I just wish I would’ve thought to have a group photo taken. Thanks again to Blythe who blessed my socks off with all her party-throwing skills, and my friends and of course my husband the chef. You all made this so fun and meaningful for me. And I thank God for 30 years of life. I wish I had something profound to say about my past or my future at this particular juncture, but I don’t. On a more superficial note I will say that I hope the next 30 include more fun parties likes this and more of Jason’s desserts. February and March were pretty dreary for us (me), as you know, but in April things started to improve. First, I went in for a check-up with our midwife and when I told her about how tired I was feeling, she suggested I try to eat more consistently, specifically more protein. When I measured small at the end of the appointment, she was even more sure this was why I was feeling so tired. She was right. It’s amazing what keeping fuel in a pregnant woman on a regular basis will do for the energy levels (and mood)! Although I cringed in the Costco line when the total came up, it was worth it. And I was thankful that it was not my thyroid that was giving me troubles; my labs came back looking great. With my improving energy levels, I felt like what we had on the calendar for the month (and even some spontaneous things that came up) were much more doable. You already know about our yard drama, so I won’t go into that further. Except I will say that some teeny little seedlings are coming up now. I was getting worried, but my hopes are up again. 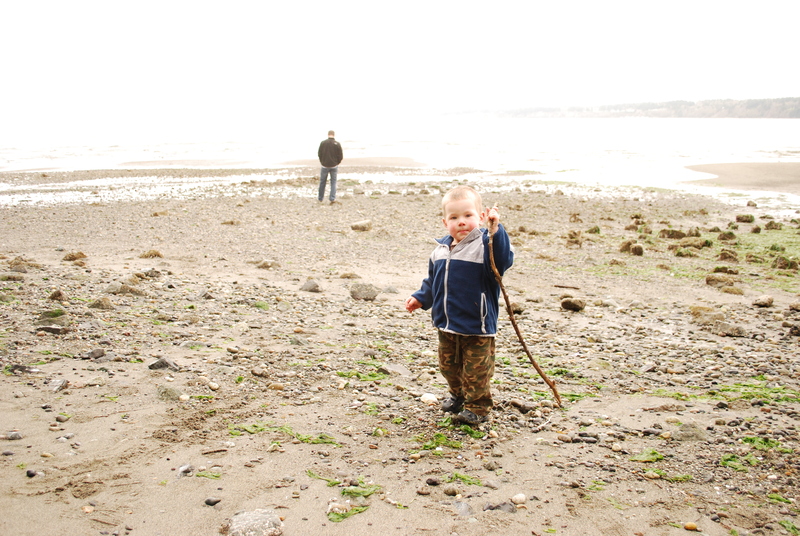 The first weekend in April we headed to Whidbey Island so I could take a little photography class from Kim Nelson. I was her only student, which was very nice. She gave me some helpful tips, and I spent some time messing around with the camera on the beaches of Langley (and everywhere else I’ve been this month). As a result, I have taken a TON of photos lately (not many of which I am all that impressed with). But, the grandparents will eat it up, right? In the hopes this doesn’t deter you from the rest of this post, here are the April photos. 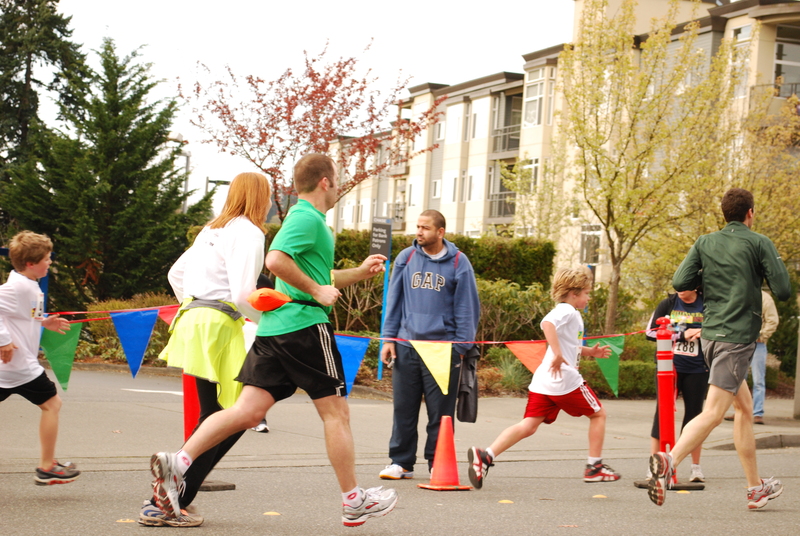 In other news, Jason did the Bellevue 10k and Ian did his first kid’s dash on April 17th. I mentioned this previously, as we were all excited about it, especially Ian’s race. Jason was feeling lackluster about his upcoming performance, but Ian was getting more and more pumped. Jason ended up having a great race. He felt better than he expected–less out of shape than he thought he would. Sadly, the kid’s dash was a disappointment. The warm-up activities were a bit too long for Ian. 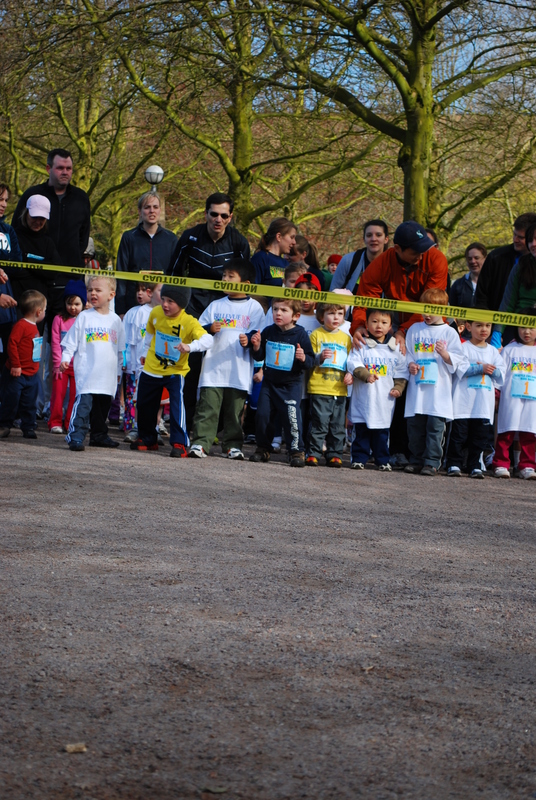 When we were just about to leave, a race official showed up and they decided to get the race going, so we stuck around. Ian got back into it at that point and was excited as he got with the other kids at the starting line. Ian is in the red shirt on the left. The race began and Ian was off with the rest of the kids but he only got about 100 feet down the course and the Seahawks marching band started up. 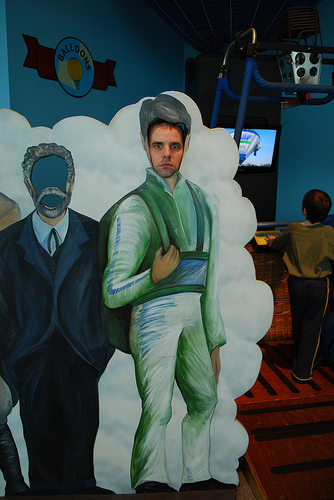 It was meant to be a morale booster for the kids, but Ian burst into tears because he hates loud noises. 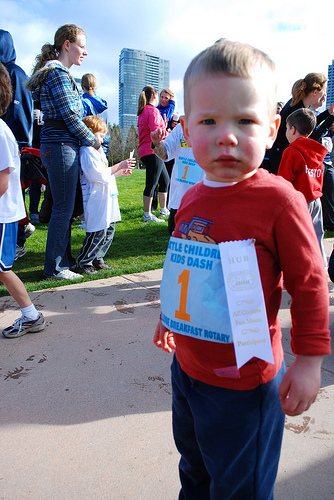 When we reached the finish line Ian got his ribbon, but as you can see, he was not all that excited about it. 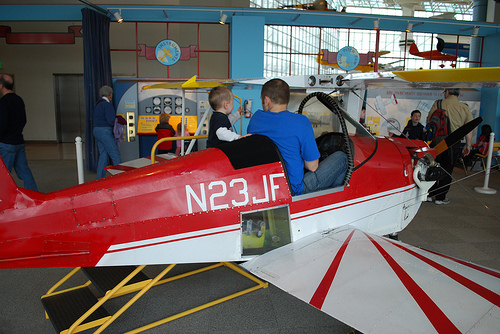 What has been way more fun for Ian has been the numerous visits to the Museum of Flight that we’ve taken this month. Our membership was soon to expire so we took advantage. 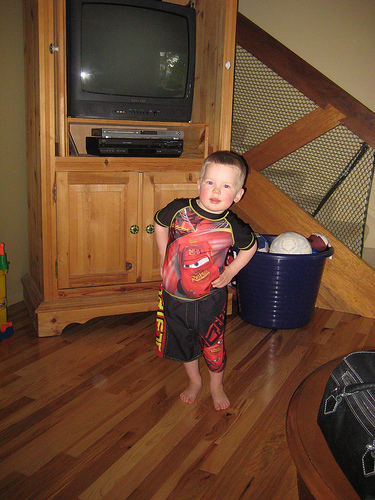 But it was also exciting because Grandma T brought Ian his very own Lightning McQueen swim outfit. For the last couple months every time we go to Costco he asks us to go straight to the kid’s clothing so he can look at these beauties. He hasn’t asked to buy them, he just wants to look. And now he has his very own, modeled for you below. Included in Mom’s visit was a shopping trip to IKEA and TJ Maxx and a sunny Saturday spent at Discovery Park (Ian can fly a kite all by himself!). We also made Easter cupcakes (which turned out to be a bomb, except for the delicious marshmallow frosting, which I would’ve eaten all by itself). And, we had a nice Easter brunch out. One of the great blessings of having Mom here was that Jason and I did a little getaway that Sunday afternoon and stayed downtown for the night. After the pregnant lady had a bawlfest because she was tired from an already-packed weekend and was predicting what she thought would end up being a disastrous attempt at romance, we headed to the Westin and had a wonderful time. We spontaneously stopped in at a Sushi restaurant (totally not like us), then hung out in the hot tub, and enjoyed the drama of Will & Kate’s romance on an in-room flat-screen TV (I wasn’t the only one enthralled). We slept in and got up in the morning to head to the Dahlia Bakery for overpriced hot donuts with rhubarb jam & mascarpone (I will definitely try this combo at home!). AND, I didn’t hyperventilate–not even once–at the amount of money we spent. For that reason alone it was a total success! After we came back to reality and Mom left for home there was a flurry of housecleaning. Then Grandpa Brad & Linda came for a visit. 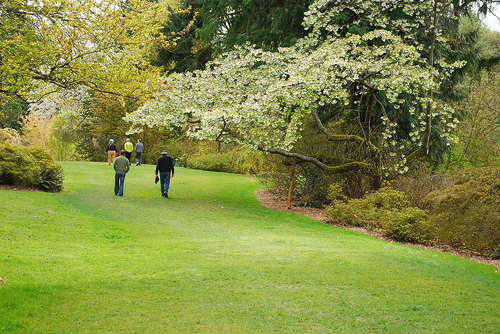 We did another trip to the Museum of Flight and a nice walk around the Arboretum. And, we finally made it to Delancey (Jason’s been waiting so long). It ended as all good things should–with Molly Moon’s. I thought I would regret passing up the salted caramel for salt licorice, but let me tell you, it was ohh soo worth it. Sitting here thinking about it all, it’s no reason my belly has grown 5 cms in the last month. I’m reminded that I ate a lot of good food. 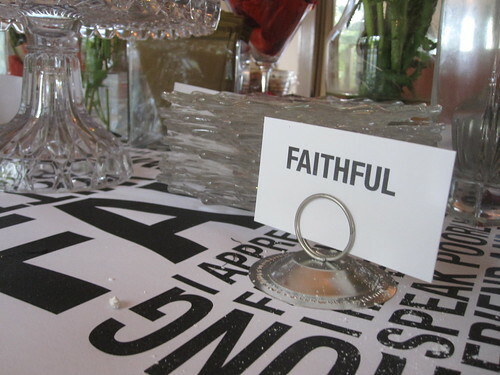 (Thank you to the family members who funded much of our eating out.) I’m also exhausted thinking about all the things we did in between that eating. May looks to be as much, if not more busy, what with an upcoming baby shower and college reunions for both Jason & I. I’m excited for it all, but am also looking forward to a few weeks of solitude and nesting in June before Baby Girl arrives. I remember in 2007, our first Christmas together, the discussion around traditions began. It was very interesting to compare our experiences growing up. I assumed we would have a fancy Christmas Eve dinner followed by a fancy Christmas Day breakfast followed by a fancy Christmas Day dinner. We would go to a Christmas Eve candlelight service. And of course we would open the majority of the presents on Christmas Eve over dessert (after all the fine china was hand washed, of course) and then open the “Santa” presents (the big ones, either in size or price) on Christmas morning, along with the stocking stuffers. Jason’s Christmases of past were a little different. And when I say different I mean toned down. His family made pizzas on Christmas Eve and had a more relaxed, family style meal. I don’t remember if they went to church on Christmas Eve or Christmas. Most of the gifts were opened on Christmas Day. A reading of Luke 2 took place as well as a special book called The Littlest Angel. Sometimes they reenacted the nativity with costumes. Santa was fictional and presents were not a huge focus. There are things I like about both of our childhood experiences. When my mom pulled out the boxes and boxes of decorations it was a big deal to me. I especially loved taking each ornament out of the box one by one as we put them on the tree. We had boughs along all the banisters. The Snow Villages came out and I would pretend they were little doll houses. There was a sense of routine around the season which I found comforting and an appreciation of beauty that I carry with me today. Jason’s experience also sticks with him. He is adamant that we read Luke 2 during this season, as he did growing up, and I really love that. I also love the sense of togetherness that the Haggard’s relaxed traditions brought about in their family. I want the presents to be sacrificial and special, but I want them to be minimal, as it was for Jason. I don’t care when they’re opened. Obviously you can tell that I’ve been thinking about this topic, or I wouldn’t be writing about it. Back in October when I started thinking about Christmas, the first things that came to my mind were what kind of cookies, cards, and decorations I wanted to do. Sadly, it was not how I wanted to use these or other things to cultivate a sense of wonder in my home about the birth of Jesus. But, the Lord has been moving me along. First it came with Amy’s post on her blog about the nativity and then a book she recommended entitled Treasuring God in our Traditions. I found it very intriguing, ordered it, and have just started looking through. The author shares some great ideas for kid-friendly activities that I’d like to incorporate or alter in the coming years. Second, is Advent. Neither Jason nor I celebrated this growing up, but I have always had a vague understanding of it and have become more interested in the last few years. It is perfect for children (and adults) because 1) it’s a daily reminder of the meaning of Christmas and 2) it’s all about anticipation. Amy also posted about some of the things her family is doing for Advent, which was very helpful, since I really didn’t know where to start. So what are we doing this year? A little of Krohn, a little of Haggard, a little of our own special twist. That last part is important; Jason reminds me that it doesn’t matter so much what we used to do or what other people are doing (I compare), but that we make sure we’re sensitive to what God wants for our own little family. My hope is that there will be lots of excitement and thankfulness about Jesus’ birth, in whatever we do. I love traditions. I love that God gave us a salvation story to celebrate and that the celebrating of it every year is in itself a tradition.